Two important documents were recently released on flooding in our region. I have asked HCFCD some questions about the report and I will have more to say about it later. But here are a few things that jumped out at me. Over 6,000 homes flooded in the Sims Bayou watershed even though Sims Bayou never came out of its banks. This indicates a failure of the City’s systems that convey the floodwater to the bayou. (pp. 14, 19) Flooding that results from water attempting to get to the riverine is not shown on the HCFCD inundation mapping tool and is often not reflected on the FEMA flood maps. The second document is a report by the engineering firm Freese & Nichols on alternatives to reduce flooding around Lake Houston. Most of the report is devoted to the efficacy of adding floodgates to the Lake Houston dam. [Click [here] to read the report -. Also, Bob Rahek has a good discussion of the report on his website Reduce Flooding – NOW! [click [here] to read his discussion]. Bob’s discussion is pretty comprehensive. I only have two comments to add. First, the cost of the additional floodgate is estimated at $47 million. The City has said that it has asked (or will ask) for a grant from FEMA to add the floodgates. But the gates could have been paid for more than 20 times from the drainage fees collected by the City since it started collecting them in 2012. City Council just approved another budget which diverts most of the drainage fees to uses other than reducing flooding. 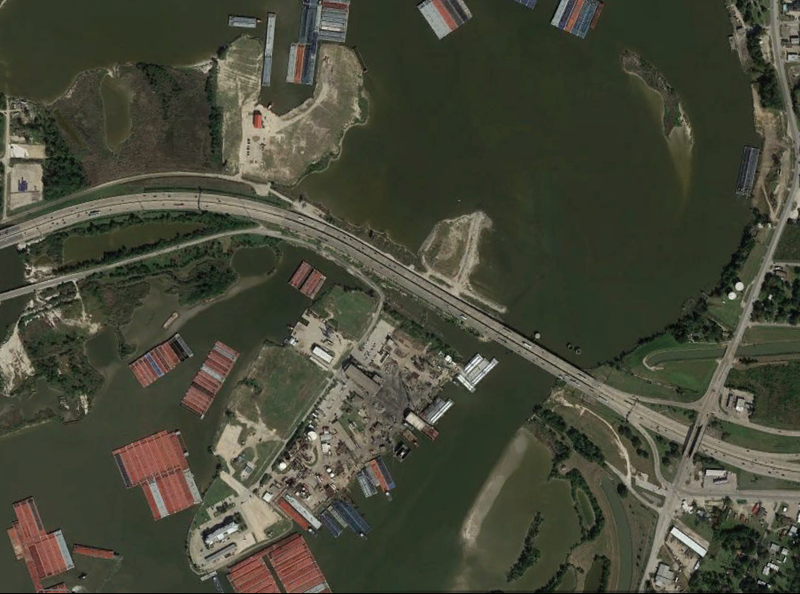 Second, I am becoming increasingly convinced that the I-10 bridges over the San Jacinto River are a critical piece of the flooding in that watershed. 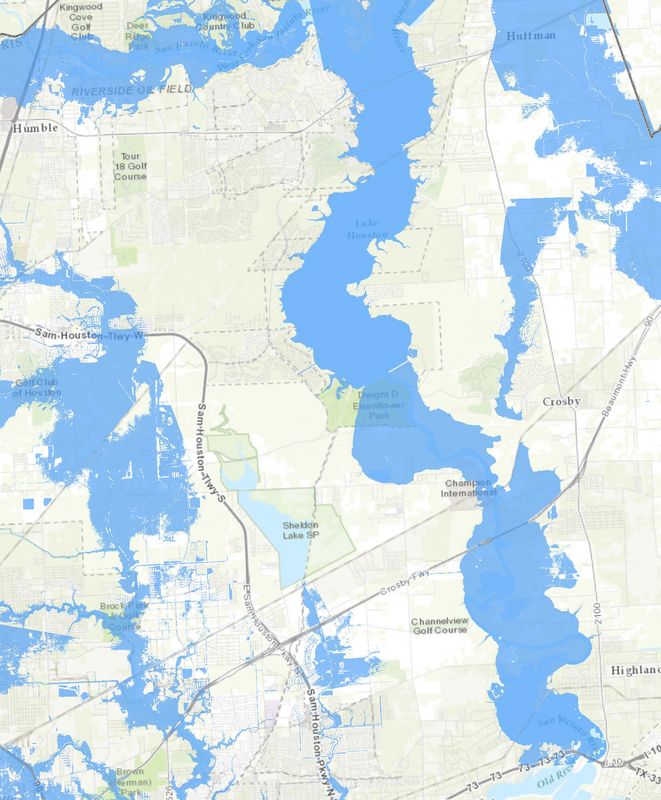 The inundation map from the HCFCD below and the satellite photos sure make it look like those bridges are basically functioning like a dam in flooding events. I talked to one person who was in the area during the flood. He said that the water was rushing through underpasses to the west of the bridges and that it was washing out the service road and scoring deep trenches. Adding floodgate capacity at the Lake Houston dam will do little good upstream and could cause even more problems downstream if the water cannot get to Galveston Bay because of these bridges. The HCFCD told me there is a comprehensive study currently underway for the entire San Jacinto River watershed. I am not sure when the report is supposed to be finished, but whatever we do in that watershed needs to be coordinated with all of the jurisdictions and entities. These reports highlight the incredible complexity of the flooding problems in our region. We cannot allow that complexity to paralyze us into inaction, but we also need to make sure that the projects we undertake are cost-effective and do not simply move the flooding to a different area. They also highlight that there are no simple, quick fixes to our flooding problems. Flooding in our region is the result of living on a flat coastal subtropical plain and years of lax regulation and underinvestment in flood control infrastructure. It is going to take years, perhaps decades, of better regulation and increased investment to make a meaningful difference.